Magen Avos is a Yeshiva for boys and Bais Yaakov for girls in Beit Shemesh that was founded in 1995. Rabbi Daniel Simon, a musmach of Ner Yisrael in Baltimore, started the school with the blessings and haskomos of Rav Chaim Pinchas Scheinberg zt”l, Rav Nachman Bullman zt”l and Rav Shlomo Wolbe zt”l. Rav Gans shlit”a of Mattisdorf is currently the Rabbinic advisor. Its mission is to provide a strong Torah education along with a solid secular education in a warm and supportive environment which builds love of Torah, good middos, and Ahavas Yisrael. Students have gone on to quality yeshivas and Bais Yaakov high schools upon graduating. The Rebbes and Morahs are graduates of the finest Yeshivas and Bais Yaakov seminaries in Israel. They are positive role models of Torah observant people and are caring, experienced and professional educators. The environment and derech of the school is positive. There is an emphasis on respect for the staff, the students and for the tzelem Elokim in all Jews and has an integrated staff and student body including Anglo, Israeli, Ashkenazi, Sefardi and Chassidic backgrounds. The families adhere to a frum chariedi lifestyle without T.V. or movies. Internet usage is strictly for work and communication with family members. Students are not allowed to have internet access. Magen Avos schools offer extensive programs to help Olim to acclimate to their new home, language and culture. There is a resource room and a dedicated staff of special education teachers to help the students with special needs. The varied extracurricular programming promotes spirit and positive energy. It engages the children by utilizing their organizational, musical,, artistic, dramatic and literary talents. 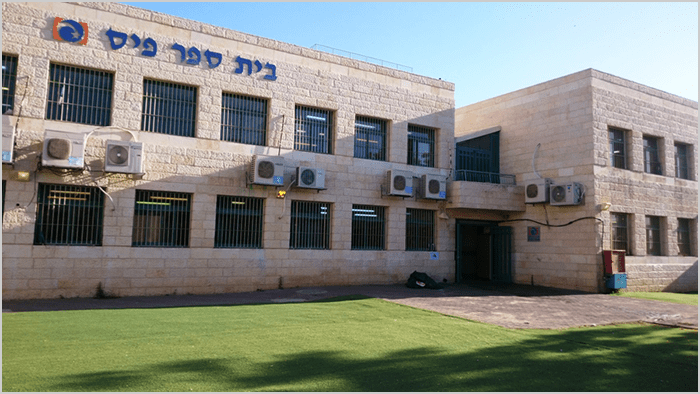 The school brings in local Rabbanim as guest speakers and takes the students to visit with Gedolim, and prominent Rebbetzins in order for them to see and experience living examples of what they are learning about. Various school trips and hikes throughout the year give students an opportunity to bond further with peers and teachers in a relaxed environment while deepening their appreciation for the beauty of Eretz Yisrael. There are currently two classes per grade from 1st through 8th grades in the boys’ and girls’ schools respectively. In addition, there are 3 yr.old, 4yr. old and 5yr. old preschool classes in the boys’ and girls’ schools. The average class size is approximately 22 students per class. The schools are located on a beautiful campus of ten dunams (approx. 2.5 acres) in Ramat Beit Shemesh Bet; overlooking the picturesque hills of the Sorek Range. The beautiful Beis Medrash allows the bochurim to daven everyday on the school premises. The children enjoy gym classes in the large gym/auditorium and are encouraged to play games during recess in the five different sports and playing areas. The school is recognized and monitored by the Israeli Board of Education.